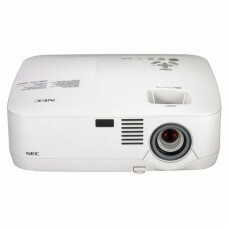 Extremely flexible, professional LCD Projector - predestined for business and educational use. Your projector is setup and ready to display your presentation about 3 seconds after powering on, with the NEC Quick Start function. The Quick Power Off function stops the cooling fan immediately after turning off the power to the projector, which makes it possible to remove the projector quickly. For a rapid shut down, the projector can be turned off without powering off the projector using the Direct Power Off function and a power strip equipped with a switch and breaker. Lamp life in Eco Mode has been extended from 4000 hours to 5000 hours (Normal mode: 4000 hours). Furthermore, power consumption has been reduced by about 15%. Power consumption in power-saving mode is 0.6 W (100-130V AC) / 0.7 W (200-240V AC). These enhancements help to dramatically reduce the TCO (total cost of ownership).